1. Why were TempShield™ inmate cell door window covers created ? Steel door window covers were originally on all cell doors. In an effort to reduce costs during the last 20-years architects designed new inmate cells doors without the steel window covering. Construction costs have been reduced but now inmates watch staff during emergencies. TempShield™ inmate cell door window covers were created to block that activity. TempShield™ was designed by retired State & Federal correctional professionals for emergency use in correctional settings. 2. Why do facilities need TempShield™ inmate cell door window covers? Staff actions during emergencies can and have prompted violent and angry outbursts from inmates locked inside their cells. 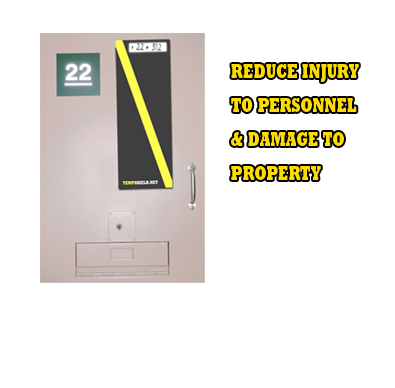 Facilities may incur property damage, additional injury to staff or inmates, or additional unplanned use of force incidents which may have otherwise not been necessary. 3. How does TempShield™ work? When a dangerous incident breaks out in a prison, the role of the correctional staff is to take charge and contain the situation before it spirals out of control. They must protect members of the public, prison staff and other inmates. TempShield ™ cell door window covers are perfect for covering windows to help de-escalate potential riot situations. 4. Are TempShield™ inmate cell door window covers expensive? No. TempShield™ costs pennies compared to an inmate breaking a sprinkler head, filing a lawsuit, initiating use of force activities, inciting riot behavior, damaging his cell, or staff/inmate injuries. TempShield™ is easily stored with emergency response equipment and deployed by responding staff. 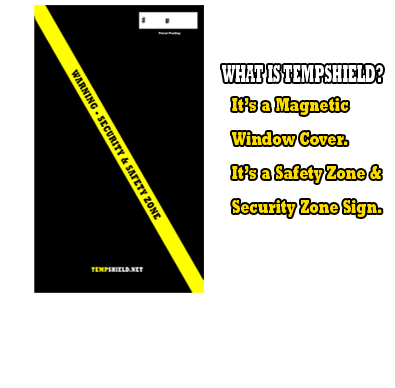 TempShield™ is a temporary flexible magnetic cover which can be stored in control centers and used by staff to temporarily cover cell door windows during emergency situations. TempShield™ has been prefabricated for use in 3rd and 4th generation correctional facilities throughout the United States. Temp Shield™ is easy to use, durable, reusable, affordable, and designed for the most common door styles. 6. How can Correctional executives save money by using TempShield ™ cell window covers? TempShield ™ cell window covers can assist in reducing inmate psychological trauma. Even after the situation is contained, many times investigators, authorities and other agencies must respond and process a complex crime scene. 7. 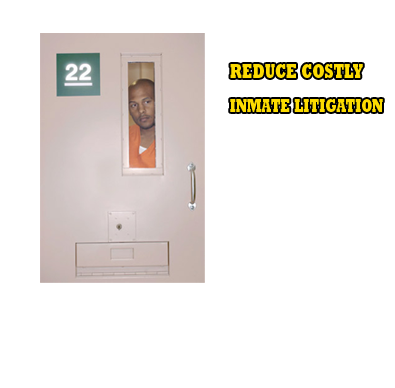 How can TempShield ™ cell window covers help to reduce costly inmate lawsuits and litigation? The legal system is bogged down with inmate’s lawsuits. Temporarily covering inmate cell door windows can help reduce the costly interrogatory responses associated with an inmate who sues because he was exposed to something he was forced to view thru his cell door window. 8. How can TempShield ™ cell window covers help to reduce facility property damage? Many times inmates will see something which compels them to lash out by destroying sprinkler systems or other facility property damage. TempShield ™ cell window covers isolate the inmate for brief periods while the staff regains control of the situation. 9. How can TempShield ™ inmate cell door window covers help to reduce inmate violent outbursts? The emotional charge associated with watching staff or inmate’s actions during emergencies should be reduced. 10. TempShield™ can help protect your emergency plans. Your executive staff spends countless hours preparing emergency plans. Many times various diversion techniques are used to regain control of the situation. It is very dangerous for inmates to be able to dissect your emergency plans. TempShield ™ cell window covers are perfect for helping to protect your staff so inmates are not viewing your staff’s actions during emergencies. 11. Can TempShield™ help protect high profile inmate movement? TempShield ™ cell window covers are perfect for helping reduce costly hospital trips. Each time there is a use of force situation the potential for a costly hospital visit exits. These hospital visits destroy facility budgets. Reducing the potential for use of force situations will reduce the potential for hospital visits.